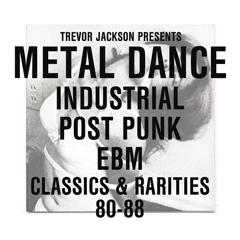 Metal Dance gives you direct 'dark machine funk' from Trevor Jackson. One of the best creatives, producers & DJs from the UK, Trevor Jackson is again here with a very precious compilation formed up with years of effort and testing. Theses are the EBM, industrial and post-punk tracks which Trevor uses as secret weapons in his sets throughout the years. From DAF to, Nitzer Ebb, Cabaret Voltaire or John Carpenter is only of the few names you can see on the tracklisting with special edits and never before seen rarities firstly on this precious double CD album. 'Metal Dance' for sure is one of the most important and tasty compilations released in 2012. A prospectus and referance fro the ones who are young & eager enough to dig deep on EBM and industrial beauties of the 80's. Lovely album!